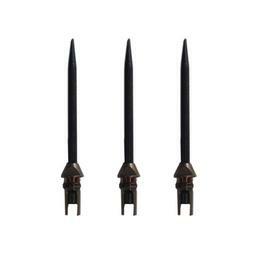 The Laserdart "Black Widow" dart incorporates many innovative concepts. It features a rough, black oxide coating on point to prevent darts from falling out, slight front-weighted dart and a slim barrel for increased accuracy. I do have have a couple reasons as to why I gave my review 2 stars, but let me first start off by saying that these darts did indeed increase my accuracy by 100%. Like I was amazed by how much of a game changer it was, but I wouldn't give these another purchase due to the poor quality of the shrink wrap that is on the top half of the shaft. Within just an hour one of the shafts came apart and smacked into the ground causing the bottom half to dent. No longer allowing me to reconnect the 2. Feel good in the hand. Best dart I've ever thrown. Money paid was worth it. these darts are great. I have never spent so much on a dart but they are the best. These have upped my game immediately. Goes back to the old saying, "buy the best and cry only once." The accuracy is impressive. I hit what where I am aiming with much more frequency. Darting .com was very quick to ship and are always a pleasure to do business with. Best darts made for consistent grip. I have never spent this much $$$ on darts before. I like the balance and the feel of these darts. First round they flew straight and true. Great darts and fast shipping love them! This is my first set of Black Widow darts,very nicely balanced.Best set of darts I have owned. Just received my darts today and they feel great in my hand. What I like most is the barrel shape as it promotes having the exact same grip every throw. Never used the spiderleg shafts before so I'm still getting used to them but the darts are flying true. Awesome customer service. Very, very happy with my purchase. When you want the best, you buy the best. More than I ever thought I'd spend on a set of darts and my only regret is not buying them sooner. They are precise. What can I say, best dart I've used. This is my second set and went with the 23 gram this time. I also have the 26 gram set and just love these Darts. Well balanced and great grip. I play in a league and noticed at least 3 others are throwing Black Widows also. 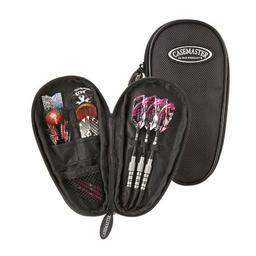 I have tried many different sets of Darts and these are my favorite. Awesome. The design facilitates the same grip every time. The dart is well balanced which gives a true trajectory. Great darts. Has improved my game tremendously. This product is unbelieveable! As soon as i gripped it, it felt like it was custom made for me! All my friends said the same. I am very satisfied with this product. I'm not anywhere near a professional in this game, but i know my delivery and accuracy has improved tremendously. Delivery was prompt. Had to contact Cust Svc with a question that was answered expeditiously by a Cust Svc Rep. The Black Widow Darts are the best set of darts I've ever owned. I'm no pro dart expert, but I do know that there are no other darts that can compare to these black widows! Over all service was great! 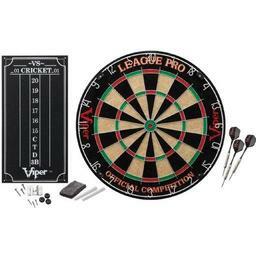 Received my darts quickly... and they shoot better than any darts I have ever thrown... a must have! I love these darts. What a difference from Hammerheads. I will never throw another movable tip dart again.